Creative Conservation is an appropriate policy for Greenwich Park . The historical layers represented by diagrams (a), (b), (c) and (d) should be conserved in a creative unity which looks backwards and forwards in time (e). 4.7a A policy of 'creative conservation' applied to Greenwich Park Greenwich Park was enclosed, as a royal hunting park, in 1433 [Fig 4.7a] and laid out in 1661 as an aesthetic design in the French manner [Fig 4.7b]. During the eighteenth century [Fig 4.7c], it was somewhat converted to the style of Capability Brown. During the nineteenth and twentieth centuries, as the public gained progressively freer access, Greenwich came to have the character of a municipal public park [Fig 4.7d]. The new facilities included a flower garden, a boating pond, a tea pavilion, tennis courts, pitches for rugby and cricket. With the new enthusiasm for garden history, dating from the 1960s, there have been proposals for 'restoration', but a great problem in knowing what to restore. Henry VIII's hunting park? Charles II's Baroque avenues? The English landscape garden? The Victorian flower garden? The twentieth century public park? One could make a case for any of them, but one would have to fight off proponents of the alternatives. I believe the best solution is the policy which Geoffrey Jellicoe described as 'creative conservation'. Park planners should take the historical layers and weld them into a new harmony [Fig 4.7e]. 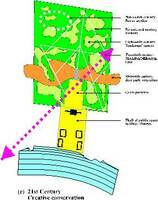 The principle of planning-by-layers can be extended to other matters: functions, aesthetics, ecology. There are many keen ornithologists who visit parks. They should plan how to adapt their park for birdlife, as an overlay. Other people like to collect firewood and chestnuts. Others love hedgehogs. These are legitimate activities, which should be catered for. When it snows, Greenwich park is full of toboggans. The slopes should be made safe and convenient for them, despite the temporary damage caused to the grass, which upsets those who maintain the turf. Because of its history, location and size, Greenwich Park has to accommodate many things. Other parks could be more specialist. One could become a fully restored Victorian park, with carpet bedding, gates, clocks, cast iron furniture, uniformed park keepers, and regular brass band performances. One could become an Athenian gymnasium, for those who wish to exercise their minds and bodies simultaneously. One could become a Spartan sportpark, for those who see exercise as a near-military activity. One could celebrate cycling. One could become a national centre for kite flying. The historical origins of the public park have led to the present situation where park managers wrestle with the aims of horticultural display, picturesque effect and organised sport. The triumvirate is perused with great determination, but the aims are incompatible. Perhaps the saddest failure is with planting design. Rock gardens of the almondï¾­pudding type have proliferated, grasslands are razed by gang mowers, assorted rhododendrons are bundled together on unsuitable sites, mottled expanses of heather are punctuated with dwarf conifers, herbaceous borders are planted without regard to colour harmony, and rose beds are stocked like vegetable gardens. Even the onceï¾­splendid art of carpetï¾­bedding has fallen on hard times. All this despite the fact that a majority of park managers come from a horticultural background. We cannot complain, like Paxton, that our parks are in the hands of broken-down contractors or retired sea captains (Parliamentary Debates 1859). But we can complain, with Cranz that 'Like all bureaucracies the park department took on a life of its own and came to be committed first of all to its own maintenance and enhancement' (Cranz 1982: 109).